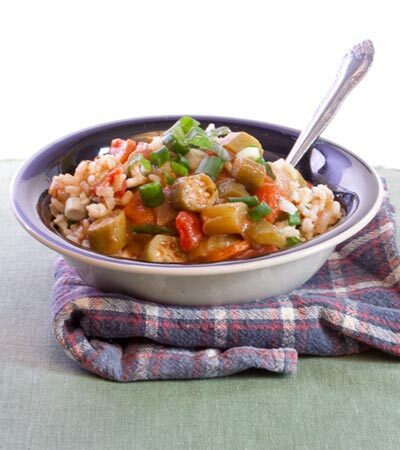 Gumbo is a savory Cajun or Creole stew served over rice. This recipe has very little added oil but big flavor. The fennel and pinch of nutmeg help give it a slight sausage flavor, which adds a depth. Want to know what others thought about this recipe? Would you like to comment on this recipe? Go to the Amazing Gumbo blog entry. In a large heavy skillet on medium heat, add flour from rue ingredients and lightly brown, stirring constantly. This can burn easily cause there's no oil to keep it from burning, so keep that in mind. Remove from heat and let cool. Transfer to a jar with a lid and pour water from rue ingredients list and shake and set aside. In a heavy sauce pan on medium heat, place canola and soy sauce. Then add green pepper, onion, celery, carrots and garlic and cover with a lid and let sweat for about 10 minutes, stirring occasionally. Next add the 2 & 1/2 cups of water from the rest of the ingredients and the roux from the jar and all of the spices, salt and sugar. Let this cook, uncovered, about 20 minutes or until carrots are tender. Stir this occasionally to prevent the roux from forming a skim on top. Add okra and cook for about 5 minutes. Last, add the tomatoes and cook another 5 minutes. 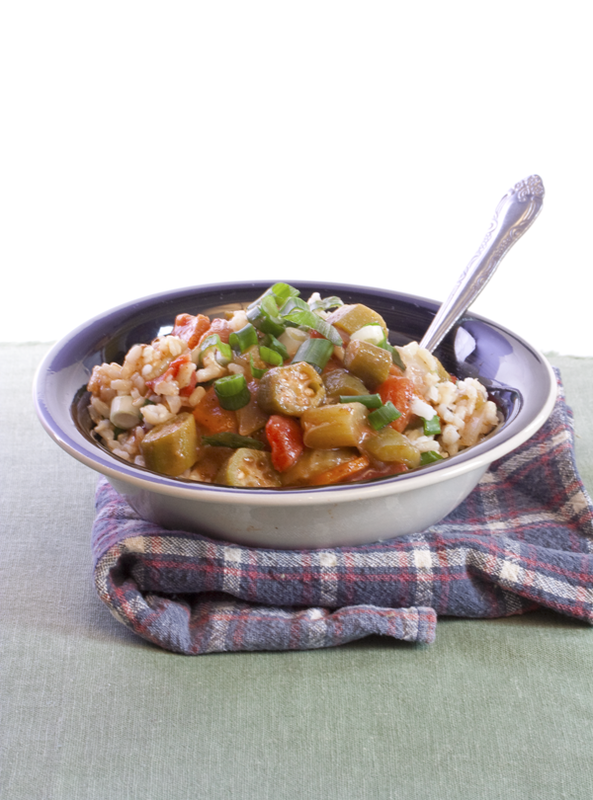 Serve over white or brown rice and top with green scallions.